The Summer Sale has helped drive the platform through a massive milestone, with over 10 million users online simultaneously this weekend. 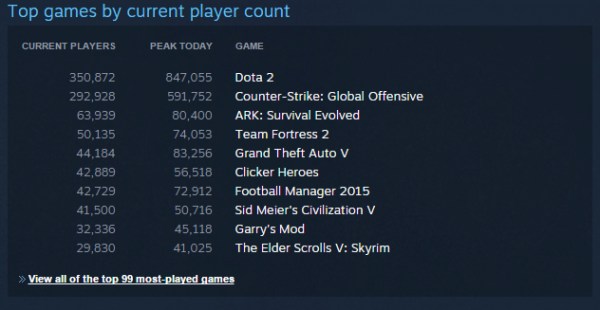 Steam’s stats page reveals that the platform’s growth is continuing to pick up speed. This time last year, the record for concurrent users stood at 8 million. With the number of simultaneous Steamers creeping past the 10 million mark just before 11am Pacific time on June 14, that’s a 25% increase over the last 12 months. The list of most frequently played games includes all the usual suspects, with Dota 2 and Counter-Strike: Global Offensive still leading the pack. Since we last took a look in March, when Steam concurrent users topped out at 9.5 million, Payday 2 and Arma 3 have dropped off the list, making way for ARK: Survival Evolved and Clicker Heroes.